End of a tiring, stormy week. The CSSS summer school, which I've popped along to when I had some free minutes, has been fantastic and very well organised by Dave Feldman and others, lots to think about after that. New projects taking off, others fluttering to the ground, some of them falling harder than others, papers in the making. Less than three months to go here in China so plans are afoot for travels both work related (I'm presenting at a school in Wuhan in a week or so) and extra-curricula (plans for doing China in October have been scaled down to tackling Sichuan for two weeks at the end of my stay). In the humid, stormy summer months I feel like I'm running low on steam a little. The program starting here on string cosmology in September should certainly perk things up and there are still many things to see here in Beijing before I leave. The huge midweek storms were not captured on camera as my camera had been lent to a movie director (who needed a digital SLR). He was the same movie director who came down with appendicitis earlier in the week and so the camera was inaccessible. He has now, quickly, recovered, thus the camera is back. A random end of the week post I'm afraid. 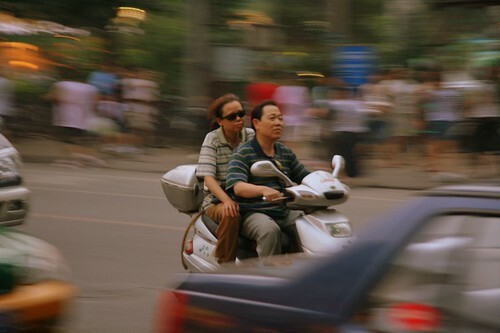 Anyway, before a friend's birthday last Saturday I was stood in Wudaokou taking shots of the local hustle and bustle and got a fun shot of some of the Wudaokouites whizzing about on their scooters. What are your post-china plans? I'll probably write about it in more detail later but I have a position at the University of Santiago de Compostela in Spain beginning at the start of November. It's a great group and I'm looking forward to getting there and getting to know the region (Galicia). It should be an excellent department to do my research in. I will however miss Beijing a great deal. Though there's a love hate relationship with the place for almost every expat, there are many things which I will miss and I have plans to come back here in the not too distant future. What are you up to these days? Send me a message if you get a chance.